At CES we spotted hordes of tablets this year, but only a few knocked our socks off with impressive specs, great value, and innovations that rival Apple's leading iPad 2. Instead of giving you the tablet laundry list of every single slate shown here at CES (and there were many) we are going to get right to the point. Asus, Acer, Samsung, and Toshiba impressed us the most with their tablets. The common themes that set them apart were higher-resolution displays, support for the mobile Android OS Ice Cream Sandwich, chassis stressing thinner and lighter designs, and reasonable prices to boot. Here is our roundup of the best tablets of CES. Asus tops the Transformer Prime TF201 -- its current stylish ace -- with the Transformer Prime TF700T by upping the display to 1920-by-1200 pixels. Images looked outstanding on a demo unit. 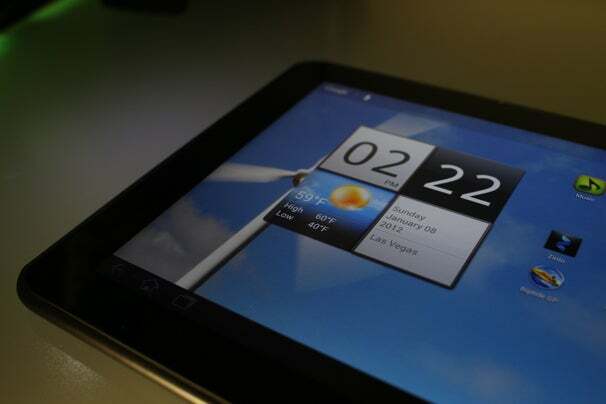 Due out in the second quarter of 2012, the device boasts NVIDIA’s Tegra 3 chip. Pricing starts at $599 for the 32GB version, and $699 for the 64GB version. Inexpensive, lightweight tablets that don't require big sacrifices to be useful remain the holy grail. That's why Asus' second CES launch, the Eee Pad MeMo ME370T, is so noteworthy. Asus says it will cost just $250 when it ships in the second quarter -- with nothing less than Nvidia's Tegra 3, an 1280-by-800 resolution and 16GB and 32GB storage options. The A700 boasted a clear 1920-by-1200 10.1-inch display. It’s powered by a quad-core 1.3-GHz Nvidia Tegra 3, on 1GB of memory. It also has minimal air gap between the display and the glass, which helps mitigate the glare tremendously. The display also has an anti-glare coating, and it uses technology similar to that of an IPS display. In the second of Samsung's big mobile announcements at the CES, the company said it would soon ship the Galaxy Tab 7.7 in conjunction with Verizon. 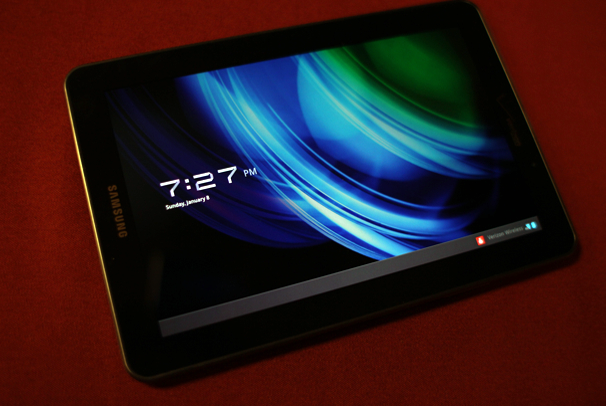 The Samsung Galaxy Tab 7.7 on Verizon is being billed as the thinnest and lightest of Samsung's tablet line, which of course includes the popular Galaxy Tab 10.1. 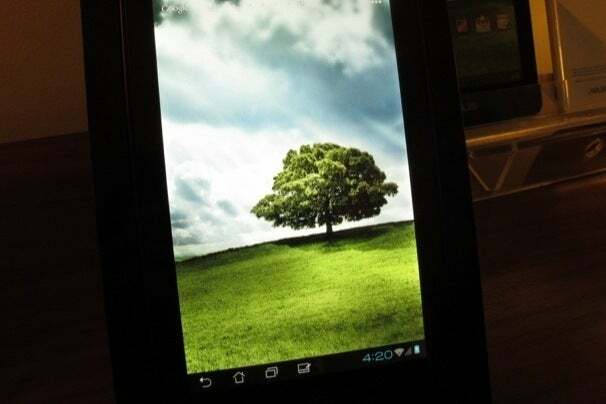 This tweener-sized device is the first tablet with a 7.7 inch Super AMOLED Plus display at a 1280-by-800-pixel resolution. Super AMOLED Plus' benefits include high brightness, which may help reading in bright environments, and vibrant colors. This 10.1-inch tablet distinguishes itself as the only model that can be called both the thinnest and lightest: It measures just 0.3-inches thick and weighs 1.18 pounds. It has a Texas Instruments 1.2-GHz OMAP 4430 multicore processor, 1GB of memory, and a 1280-by-800 resolution IPS display. The display looked good, with a minimal air-gap and a wide viewing angle; but text and graphics weren't as sharp as on the higher-resolution displays. 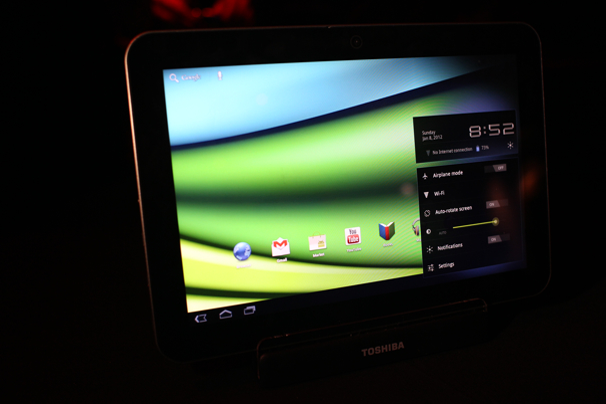 Toshiba hopes to be able to ship the tablet in the middle of the first quarter with Android 4.0 Ice Cream Sandwich. Toshiba says it will cost $530 for the 16GB model and $600 for the 32GB version.